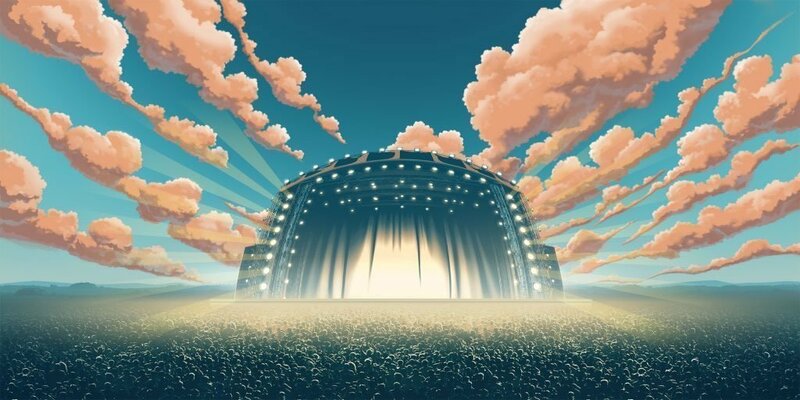 If you are a rock fan, then you are sure to love the amazing Guns N’ Roses online video slot from NetEnt and all the options it gives you to win big prizes. However, what is truly incredible is just how faithful the designers of this 5-reel, 20-payline game were to the energy, style and vibe of the iconic band that the game is named after. So, let’s rock on and see what Guns N’ Roses video slot has to offer. As the game loads, you know you’re in for something special. The opening intro video really gets your blood pumping with snippets of the band on stage and their iconic music playing in the background. This slot’s main game screen places you right at the center of the crowd at a GN’R gig and has special effects and lighting that really make you feel like you are at a concert. All around you, you will see the audience bobbing their heads to some of the biggest Guns N’ Roses tracks. In fact, on the bottom left of the screen, you can click on ‘set list’ where you will see the lineup of songs including: Welcome to the Jungle, Sweet Child O’ Mine, Paradise City, November Rain and Chinese Democracy. Besides the rock concert atmosphere, the game’s 5 reels, 3 rows and 20 fixed betting lines will ensure that there is always plenty of fist-pumping action. You can adjust the bet level and coin value. Among the many features that the slot offers include expanding wilds, wild substitutions, a solo multiplier, the Appetite for Destruction wild, bonus symbols and a bonus wheel, the Crowd Pleaser bonus game and Encore Free spins, among others. In the main game, the key features to look out for are the Legend Spins, Solo Multiplier and the Appetite for Destruction Wild. Legends Spins – This feature is randomly activated and gives 1 stacked wild on the first spin, then 2 re-spins with 2 stacked wild reels. On the first re-spin, reel 3 is covered by a stacked wild, then on the second re-spin, reels 1 and 5 are covered with stacked wilds and on the third re-spin, reels 2 and 4 are filled with stacked wilds. Solo Multiplier – this is an interesting feature of this game which works by randomly giving you a multiplier between 4x and 10x on a wining line when there are at least 3 matching symbols. All winning lines from the spin are multiplied by the multiplier. Appetite for Destruction Wild – this is an overlay wild in the shape of a cross that can land randomly, either partially or fully displayed on reel 3 on one of the positions. This wild will substitute for all other regular symbols, but note that during this wild feature, there are some limitations being that no other feature can be activated. The Guns n’ Roses slot features five premium symbols that include the three band members, Axl Rose, Slash and Duff McKagan. Of these, the Axl Rose symbol is the highest-paying, offering 750 coins for 5 matched symbols. The other 2 premium payout symbols look like guitar picks with images from the band’s albums. There are also the lower value symbols being the common A, K Q, J and 10 as well. The special symbols include the wild, which is the iconic Guns N’ Roses logo and this symbol can expand over the entire reels. There is also the Bonus Wheel and Encore Free Spins symbols that trigger their respective features. Guns N’ Roses does offer 3 bonus features being the Encore Free Spins, Crowd-Pleaser Bonus Game and Coin Wins. When 3 bonus symbols appear anywhere on reels 1, 3 and 5, it activates the bonus wheel. You need to click the stop button to see which feature you will be awarded. Take note that the minimum win is 200 and the max is 600; this is then multiplied by the bet level played. As you can see, these features have the potential for some huge payouts. The Crowd Pleaser bonus takes you to a screen that has a selection of eight musical instruments. You are given a certain number of picks of the instruments, each of which gives you a random gift if chosen. You can also win additional chances to pick more as well as activate 10 Encore Free Spins. The Guns n’ Roses Encore Free Spins feature offers you 10 free spins when activated. During the Encore free spins session, a symbol representing one of the band members appears as an overlay, stacked wild on reels 2,3 or 4 for each spin. The band member symbol then acts as the wild symbol on the remaining reels for the spin. Free spins are played at the same coin value and bet level as the round which activated the Encore Free Spins feature. You cannot win additional free spins during the Encore feature. The Guns n’ Roses slot does not have a fixed jackpot and it is not linked to a progressive jackpot. As you can tell from the plethora of features, free spins and bonus rounds, there is the opportunity to bank some serious cash. Guns n’ Roses is played with 20 fixed betting lines and up to 10 bet levels. The game has a theoretical return to player of 96.98%. Guns n’ Roses is a high volatility slot, but the fact that there are so many bonuses and ways to win means you can build a decent bankroll between wins. With the Guns n’ Roses video slot, NetEnt have gone all out to faithfully capture the essence of this well-known band. 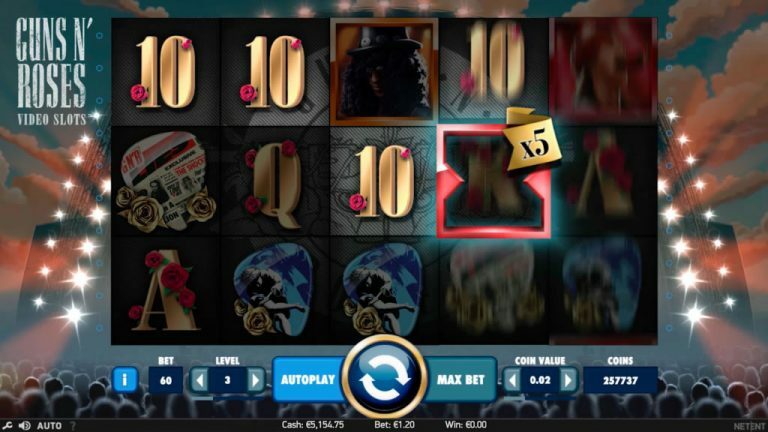 By combining the very best in slot game technology with images and footage of the legendary Guns n’ Roses, NetEnt have developed a very compelling and entertaining game that will appeal to all music lovers, even if you’re not a die-hard rock fan. The slick gameplay, sharp graphics, mind-blowing soundtrack and wealth of bonus features make this slot nothing less than exceptional.